Oct 08 - FreeFixer 1.19 released. Sep 04 - FreeFixer 1.18 released. May 15 - FreeFixer 1.17 released. FreeFixer is a general purpose removal tool which will help you to delete potentially unwanted software, such as adware, spyware, trojans, viruses and worms. FreeFixer works by scanning a large number of locations where unwanted software has a known record of appearing or leaving traces. The scan locations include the programs that run on your computer, the programs that starts when you reboot your computer, your browser's plug-ins, your home page setting, etc. FreeFixer does not know what is unwanted, so it presents the scan result and it's up to you decide if some file should be removed and if some settings should restored to their default value. Please be careful! If you delete a legitimate file you may damage your computer. To assist you when determining if anything should be removed you can find more information at FreeFixer's web site for each item in the scan result. You can for example see what other users chose to do in the same situation. For more detailed information about FreeFixer, please see the User's Manual. Download FreeFixer here. FreeFixer is freeware and Windows 2000/XP/2003/2008/2016/2019/Vista/7/8/8.1/10 compatible. FreeFixer runs on both 32- and 64-bit Windows. Screenshot showing some of FreeFixer's scan result. 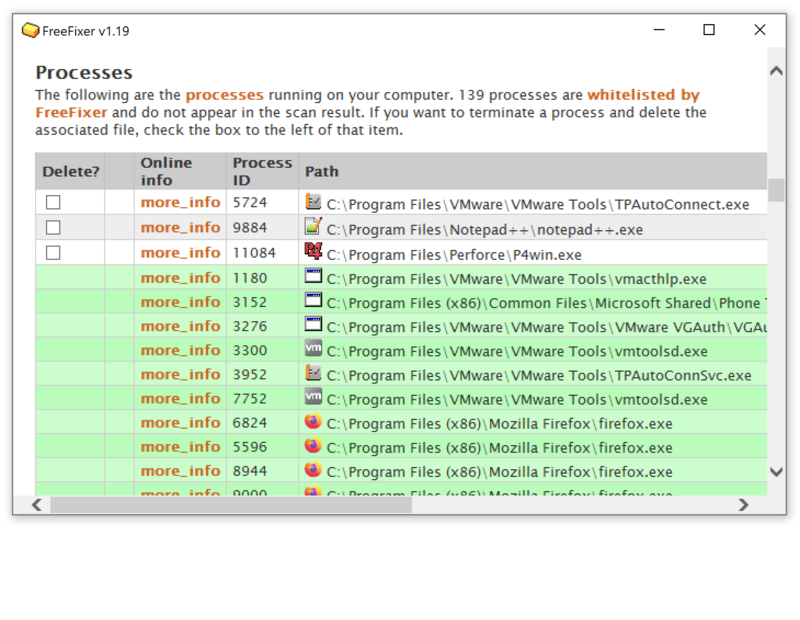 Files listed with green background are on FreeFixer's list of trusted files. The files with white/gray background are unknown to FreeFixer, so it cannot say anything about them. (In this case, they are all legitimate files). When FreeFixer is unable to delete files in normal Windows mode they are registered for delayed removal with FreeFixer's Native Deleter, which removes the files upon the next reboot. 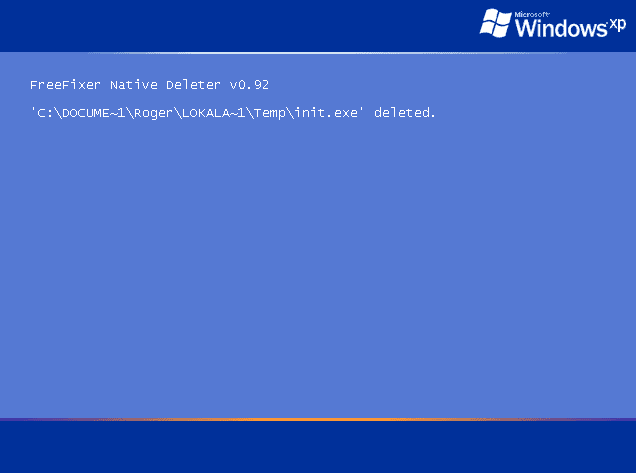 The actual delete operation is done before the logon screen appear. The majority of malware can be deleted at this point.